Tacking a sailboat, or ‘Coming About’, means changing the direction (or tack) of a sailboat by turning the bow of the boat up through the wind. In order to sail upwind you must tack back and forth across the wind. The left hand side of a boat as you face the bow is the port side. The right hand side of the boat as you face the bow is the starboard side. At the bottom of the diagram the sailboat is initially on a port tack. To determine if a boat is on a port or starboard tack, you must know which side of the boat the wind hits first. 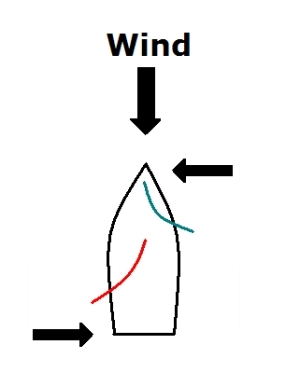 In our diagram the boat is initially on a port tack – the wind is hitting the port side of the boat first. When the helmsman (the person steering the boat) wants to tack, he will call out to his crew “Ready About” or “Ready to Come About”. This signals the crew to ready the sheets (sheets are the lines that control the mainsail and foresail). Readying the sheets means making sure that they are not tangled; that they will be free of any obstruction and that they are positioned to best facilitate carrying out the tacking maneuver. When the crew has readied the sheets the crew will yell, “Ready”. The helmsman will then say, “Helms Alee” or “Hard Alee” to notify the crew that the turn up through the wind is being initiated. It is important that the sailboat have enough speed (momentum) to carry itself through the turn. Turning the boat sharply is not only hazardous but will also cause a sudden loss of boat speed and the boat may stall head to wind (in irons). Turning the rudder approximately 33 degrees will provide a smooth and controlled turn without much loss of boat speed. It will also provide the crew with ample time to control the jib sheets and mainsheet. As the boat makes the turn, the bow of the sailboat begins to point more directly into the wind and the jib and then the mainsail will begin to luff (flutter). At this stage and in light winds, the windward (upwind) jib sheet can be released and the leeward (downwind) jib sheet can be tightened as the boat comes around onto the new tack. It is a common mistake for novice sailors to over tighten the new windward sheet (formerly the leeward sheet before the boat changed directions) which makes the sail too flat and less efficient. It is better to have the jib more rounded once the boat has tacked and then tension the jib sheet as the boat increases speed and begins to turn more up into the wind. In stronger winds and bigger waves, boats have more difficulty in carrying boat speed through to the completion of the turn. To help swing the bow of the boat onto the new tack, instead of releasing the windward jib sheet as the jib begins to luff at the half way point of the turn, leave the windward jib sheet cleated and allow the jib to blow back onto itself (this is called backing the sail). Since the jib is more flush to the wind, the wind will push the bow of the boat through the turn onto the new tack. As the boat begins to swing onto the new tack, the windward jib sheet can be released and the new windward jib sheet can be hauled in as the jib moves across the foredeck.Once the boat has finished tacking and the sails begin to fill, the mainsail and the jib can be trimmed to the new point of sail. While there are lots of resources on the web discussing the specifics of tacking, there is no substitute for actually experiencing it on your own. Stalling midway through a tack is a common problem and it all relates back to boat speed and carrying the boat’s speed through the turn. Not having enough speed boat speed before initiating a tack will most certainly cause the boat to stall. Turning the rudder too sharply will act like a brake and will drop boat speed dramatically causing the boat to stall. Turning the sailboat too slowly will result in the boat slowing downing before it can complete the turn onto the new tack. Improper sail trim, (i.e. sails eased out too far as you enter the turn), will cause the sails to be less efficient as the boat turns more into the wind cause premature luffing. Boat speed will drop quickly as the turn is entered and the boat will stall. Releasing the windward jib sheet too soon will de-power the jib, increase drag and cause the boat to lose speed rapidly. When a sailboat stalls with no forward movement and with it’s bow faced into the wind, the boat is ‘in irons’. Without movement you lose steerage. Eventually however, the boat will turn to one side of the wind or the other. The sailboat may fall back onto its original tack or it may fall onto the new tack. To help the boat swing to one side of the wind or the other, you can ‘back the sails’ by using the sheets or by physically holding the sails out to the side. Pushing the mainsail to windward will push the stern downwind. Pulling the jib to windward will pushing the front end around. Either action will cause the boat to turn away from the wind, which will allow the sails to fill with air and enable you to regain control over the boat. On smaller boats, the rudder can be used to sweep the bow off to the side of the wind. Pull the tiller slowly one way as far as you can and then push the tiller fairly quickly across the boat. The rudder will act like a paddle and help swing the bow. In some situations once a boat has stalled, it will actually begin to drift backwards through the water. Turning the rudder in one direction will swing the bow in the opposite direction. Again, this is another technique for turn the boat off wind to gain control.